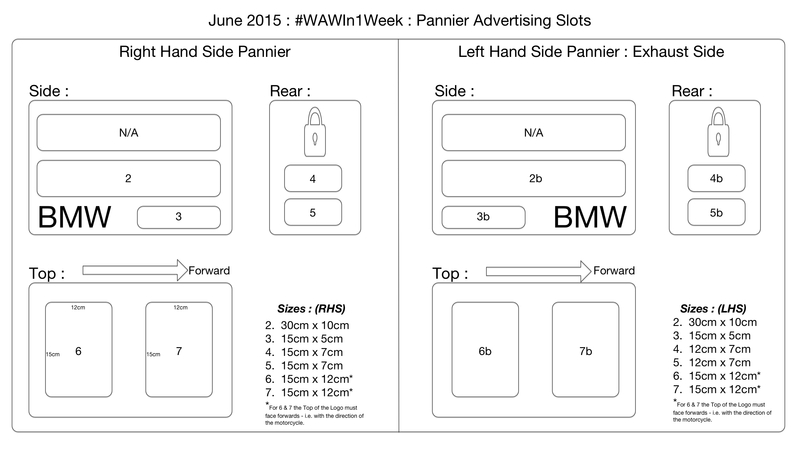 Further to my previous posting in relation to advertising spots available for my forthcoming #WAWIn1Week Trip I am pleased to share with you all the Pannier Slot availability. Please note this is subject to change and operates on a first come first served basis. Please contact me to confirm and provisionally book availability. 1. Contact me and inform me of the positions you would like. There are two options. b. A twin slot, which can only be a pair. So for example 2 and 2b, or 7 and 7b. Combinations of slots will not be accepted. 2. I will confirm availability and provisionally book you that slot. 3. You will then have your vinyl advertising stickers made up and sent to me. 4. Upon receipt your slot will be confirmed and your stickers added to my panniers. Firstly Why!?! Thats simple this is my first such trip, but hopefully not my last. If I can cover this trip with some form of sponsorship, and this is shown in the associated media, it puts me in a much better position when the next trip comes along so I can approach people with a proven track record and hopefully some good reports from the sponsors, who knows next trip it may even be my current sponsors (you) who cross over to the the new plan! And also importantly I won’t forget my original sponsors when it comes to offers for the next trips, oh and of course there will be no expectation from anyone involved this time round to stay around. People always say if it is too good to be true it probably is. This is good and true, neither of us have anything to loose. I am looking to the future and trying to build a reputation and you are being given the opportunity of free advertising along the World’s Longest Coastal Route in Peak Season! I am offering this as a freebie, from me to my sponsors. Therefore it is not open to everyone or everything. Put simply I am interested in motorcycling, tourist, travelling, well branded and trusted advertisers, but am more than open to helping out newbies in these industries. No adult material will be accepted. No pro / anti political, sexual, lifestyle, religious, non religious, sectarian, bigoted, racist, or in any way questionable (by me or otherwise) material will be selected. After all it is a freebie on my bike so to avoid any confusion, I have the ultimate and final say, if you don’t like that I’m sorry but you can always pay for your advertising elsewhere and then have the rights associated with it. No contract is being made between me and you, I am offering some free advertising for you along a brand new tourist attraction, the longest coastal road in the world. 1500+ miles of free advertising along with my social networks and tagging etc. If I don’t make it, have to stop or turn around and quit I’m sorry but sometimes real life gets in the way. After all you have lost nothing it was a freebie. I don’t want this to sound in any way negative it should be a great trip so let’s get it rolling rolling right. Who wants some free advertising!